Sludge at the bottom of swine lagoons can be a challenge. But what if that sludge could be removed and used not only as fertilizer, but for renewable energy as well? The Department of Biological and Agricultural Engineering received a grant of $144,711 from the N.C. Bioenergy Research and New and Emerging Crops Initiative to investigate the potential for integrating swine lagoon sludge into the North Carolina bioenergy industry. This two-year project will develop and evaluate economic systems for sludge removal and drying, and characterize the removed, dried sludge as a fertilizer and a combustion feedstock. “Swine lagoon sludge management is critical to the operation of swine facilities,” explains Dr. Mahmoud Sharara, assistant professor in the Department of Biological and Agricultural Engineering (BAE) who will lead the project. In this challenge Sharara sees opportunity. Currently only 11 percent of the North Carolina Renewable Energy Portfolio Standard’s (N.C. REPS) goal of electrical generation from swine waste to energy facilities is met. Most of this goal is reached from methane capture systems on swine lagoons. However, very few swine lagoons in the state have these systems and Sharara acknowledges other approaches can be developed. This is where sludge comes in. 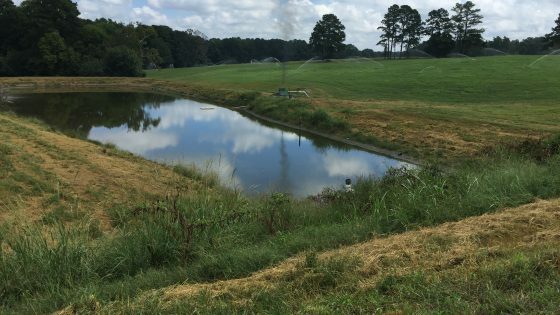 Sharara estimates a more efficient way of utilizing sludge would fully satisfy the N.C. REPS from swine manure in 8 to 14 years. Sludge is made up of organic matter that was not broken down fully during treatment in the lagoon. For this reason, it has the potential to be utilized as a bioenergy feedstock. It is currently recommended that sludge at the bottom of swine lagoons be removed every 25 years. While removal of sludge is important to keep lagoons properly functioning, the process can be expensive and inefficient. By developing more economical ways of drying and processing sludge, something of extra value can be created. Once removed, this material can be used as a fertilizer right on the farm. However, removing and finding a use for this sludge can be a challenge. The close nature of swine farm distribution in the eastern part of the state results in less land for farmers to utilize for fertilizer distribution. However, drying and processing sludge would make it easier and less expensive to transport. From there processed sludge can be utilized in several ways – making something useful from something once considered a management challenge. Ultimately though this project and related research, Sharara wants to ensure that animal waste is fully utilized as a resource.